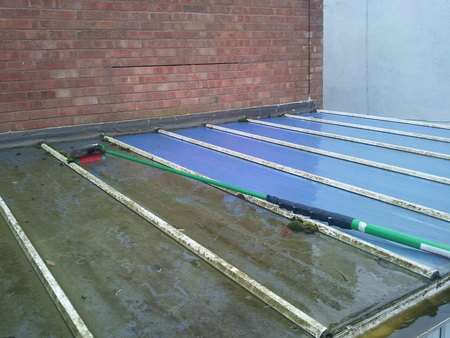 As you can see, our reach and wash system, will clean your conservatory roof extremely well. In the video, you can see us using heated water to achieve an amazing clean......even in icy conditions. Dont worry, the heated water will not crack any glass. Why? Because the water is warm - meaning the water does not freeze our hose pipes in the cold weather. The water is never boiling hot, which means it will not damage glass of any kind. If you have any questions regarding conservatory roof cleaning, or you would like to book a free quote, then just contact us via phone, text or email. We cover Lincoln, Louth, Skegness, in fact most of lincolnshire.